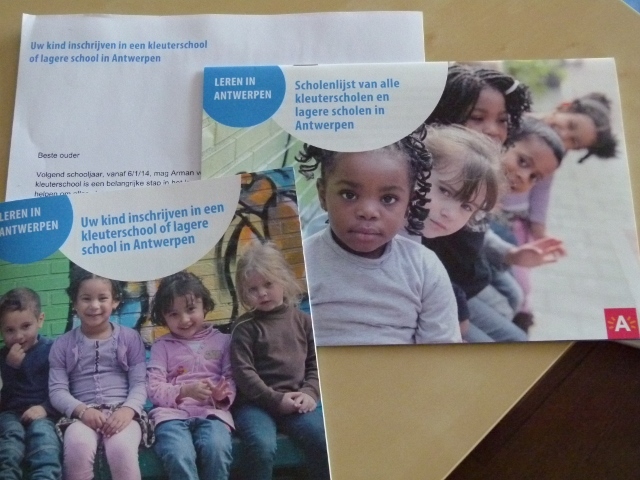 One of the things I have learned about Belgium is that almost every child starts his or her preschool education at the age of 2.5, which means that our 1.5 year old kid has only 1 year left before he starts his preschool education. I was curious about the process and asked a lot of questions to my wife. She said that the ministry of education would send all the required documents and information for the process, so we started to wait for it enthusiastically. Finally the big day came and we have received our mail recently. I must say that I’m impressed by the contents of the mail. The booklets sent to us are not only very well designed graphically, but also contain all the necessary information, describing all the steps required to start and complete the registration for our son. It gave me yet another opportunity to exercise my Dutch reading skills, and thanks to the authors’ use of plain language, I was able to understand almost all the instructions. All in all, the process seems to be simple and straightforward: We’re going to log into a web site, pick up the first few school names that we prefer (they have sent us a detailed list of all the schools via mail), submit our choice and then wait for a few weeks, at the end of which we will be informed about the school, and go there to physically register our son by signing the relevant documents, thereby completing the process. My heartfelt thanks go to everyone involved in designing those informative booklets, so far I’m very much satisfied by the way the government institutions handled the communication for the first steps of our son’s education. I’m excited and eagerly looking forward to the day of starting the first step of registration. An example of Chinese parenting style: what to do when your son is addicted to online games? Sick and tired of his son playing video games and not listening to him, a father in China decided to take matters into his own hands… well, sort of. Instead of sending his son off to addiction camp or stripping him of internet and gaming rights, Mr. Feng (冯先生) chose to hire an online “hitman” to school his son. This may be an extreme or exaggerated example but it did not keep me from remembering my relationships with computer games in the past. The contrast is obvious: 20-25 years ago, back when I and my friends busy playing with computers such as Sinclair Spectrum 48K, Commodore 64, Amstrad or Amiga 500, the only social aspect of those games were close friends we already knew from school or the neighbourhood. There was no Internet, thus no online games. The other players were either the computer or your friends sitting next to you. Playing a realistic 3D combat game with someone who is a total stranger to you was unimaginable at all. And when we were bored with the games, we either sat down to create our own computer programs and games, or we read articles about programming, or how to hack the games.